News has come in from people at the site that the Sunrise Celebration has been cancelled due to bad weather. The website appeared to have crashed later in the evening. The Daily Telegraph has however stated that the festival is cancelled. 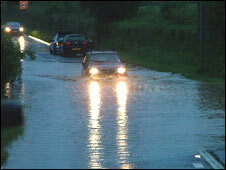 The BBC has also reported on severe flooding in Somerset. More news when we get it. In the meantime, you can follow developments in the forum. WeÃ¢â‚¬â„¢re definitely going to do it next year Ã¢â‚¬Â¦ and weÃ¢â‚¬â„¢re looking forward to seeing you there. Thank you for your patience, support and understanding. Watch this space for our next announcement . Right now, weÃ¢â‚¬â„¢ve got an awful lot of infrastructure to carefully dismantleÃ¢â‚¬Â¦ and a lot of drying out to doÃ¢â‚¬Â¦ So too have the people who actually made it all the way down to Somerset and who joined us on site for our first day. WeÃ¢â‚¬â„¢re sorry too, to those who arrived later and were turned away. We had to stop but till the last possible minute we were pushing on through the wind, the rain and the floods in the hope that we could still make it happen for everyone. The site is nearly clear. ItÃ¢â‚¬â„¢s still waist deep in water in places and the mud makes last yearÃ¢â‚¬â„¢s Glastonbury look like a tea party. But weÃ¢â‚¬â„¢re on it. Most cars have been rescued from the car park. Most of our much beloved Sunrisers are on their way home, reasonably dry and safe once more by now we hope. Meanwhile, weÃ¢â‚¬â„¢ve been besieged with kind offers of support, from ticket holders, site crew, entertainment providers and stall holders alike. WeÃ¢â‚¬â„¢re fully aware of how let down and frustrated so many people feel. ItÃ¢â‚¬â„¢s rotten to be robbed by the weather. But weÃ¢â‚¬â„¢re NOT going to let it beat us. WeÃ¢â‚¬â„¢re in talks, right now, about holding Sunrise again, not next year (as we suggested in an earlier bulletin) but later THIS SEASON. All tickets will be valid, regardless of whether you got here and swapped your ticket for a wristband or you still have your original ticket. If you bought one, we have your details. WE WILL be in touch. And your ticket wonÃ¢â‚¬â„¢t just admit you to our next eventÃ¢â‚¬Â¦ it will be worth EVEN more. WeÃ¢â‚¬â„¢re going to make it up to everyone. We promise. More details as soon as they are firm and clear enough for us to release. Meanwhile thank you all once more for your love, patience and understanding. Our heartfelt apologies go out to all who have been let down by this catastrophe. We are feeling a bit shell shocked, a mixture of disbelief at the misfortune of Sunrise this year and sadness that what was set to be such a successful event has just become a muddy quagmire in the flash floods that hit Somerset. But behold a miracle has manifest! We are excited to announce Sunrise WILL happen this year. We now have a new date, a new locationÃ¢â‚¬Â¦ and to compensate all our ticket holders for their lost weekend, weÃ¢â‚¬â„¢re also giving you full FREE access to another world class festival! WeÃ¢â‚¬â„¢re sorry, we love you, and weÃ¢â‚¬â„¢re going to make it up to youÃ¢â‚¬Â¦ big time. Plus The Mighty Boosh, Bill Bailey and Beth Orton. And er, did we mention Leonard Cohen? For the full list of whatÃ¢â‚¬â„¢s on at The Big Chill go to their website. For the full list of whatÃ¢â‚¬â„¢s on at Sunrise, give us a few days. WeÃ¢â‚¬â„¢re still cleaning up a very muddy field. For more details on whatÃ¢â‚¬â„¢s been going on and whatÃ¢â‚¬â„¢s likely to happen next, keep coming back to this site over the next few days. WeÃ¢â‚¬â„¢ll also tell you, as soon as we can, exactly how you get to exchange your Sunrise ticket for a Sunrise at the Big Chill ticket. We are absolutely shattered, all of us. the whole team. We’ve been going at it day and night, a constant battle against the mud, the rain, and disappointment. that devastating clap of thunder, on thursday afternoon, will stay with us for the rest of our lives. One minute we were getting ready to welcome everyone in, the next we had no option but to send them all away. It was not until later that night, during a brief break in the rain that we had a horrible realisation. Not only was it over, it might never happen again. A mixture of optimism and a simple inability to pay the extortionate amount asked, meant that we had no cancellation insurance! We could hardly believe it. But it turned out to be an offer from the heart. The deal is simple and sincere. We get our own field right next to The Big Chill, probably with it’s own separate entrance! the space is slightly smaller than our own site but there’s still plenty of it. The Big Chill is BIG! There’s room for us all to camp together, play together and party together. Despite the fact that a Big chill ticket is Ã‚Â£129, we are able to offer a straight swap (existing sunrise ticket holders only, offer not transferable). There may be a Ã‚Â£2.50 administration charge, but nothing else. For your Ã‚Â£2.50 you get to defy the laws of time and space by being in two places at once. You get to be at Sunrise and you get to be at the Big Chill too. You also get priority booking and a guaranteed discount on your ticket for Sunrise 2009. Plus you also get the chance to help us make good on a rash promise. During our first meeting with the big chill they asked us how much electric power we would need running to our field, we looked at each other and then back at our would be host. ‘how about none at all?’ we said. ‘Suppose we do the whole thing on sun and wind power?’ A stunned silence. It hadn’t dawned on them that someone might contemplate running an entire event on alternative technology. There was a stunned silence on our part too. Could we really do this? could we kick our bio-diesel habit? We’re still not sure but we are going to try. We’re also bringing our own internationally acclaimed Eco Loos. If you simply can’t make Aug 1-3 because you are going on holiday, well, we understand, but rather than a refund, why not request a ticket to sunrise 09, you’ll be saving money on next year’s price and you’ll be helping us greatly also.